The first people reached India from Africa around 40,000 BC. There were probably still Neanderthals and Denisovans further north, but not in India. At first Indian people probably got most of their food from fishing and gathering shellfish, like other people around the world at this time. But around 7000 BC, some people – probably recent arrivals from West Asia who brought their seeds with them – began farming along the river of the Indus Valley at sites like Mehrgahr (in modern Pakistan). At Mehrgahr, farmers used cattle-drawn plows and African donkeys to farm wheat and barley, and kept sheep and goats. They planted date palms, too. The village of Mehrgahr had mudbrick houses with four rooms. People used baskets to keep their stuff in. They traded with people as far away as Afghanistan, to their north, to get pretty blue stones called lapis lazuli for their jewelry, and they also made beads out of seashells and stone. Possibly they used these beads as a sort of money. Like West Asian farmers, the people of Mehrgahr used animal sacrifice to keep their gods happy. They also made clay figurines like the ones from Mesopotamia. And by 5500 BC, they were starting to make pottery. There were early farmers in other parts of India too: in the upper Punjab, in the western Himalayas, in Gujarat, on the north-western coast, and along the Ganges river valley in the north-east, and on the southern part of the Deccan plateau in Central India. Indian farmers also tamed local cattle and water buffalo and maybe local sheep, and started to grow cotton for cloth. They couldn’t grow wheat or barley, because those crops needed winter rain, and in most of India rain falls in the summer, with the monsoon. About 4500 BC, new people arrived in the Indus River Valley. This was probably yet another group of migrants from West Asia. 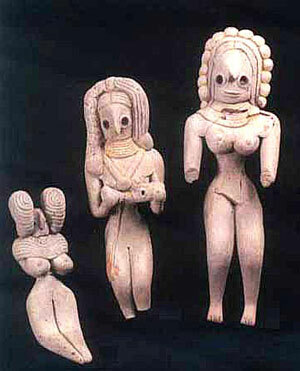 These people eventually started the Harappan period and brought India into the Bronze Age. The Young Oxford Book of Archaeology, by Norah Moloney (2000). A general introduction to archaeology, but with a good chapter on the Harappans. Eyewitness India, by Manini Chatterjee (2002). Easy reading. A Peaceful Realm : The Rise And Fall of the Indus Civilization , by Jane McIntosh (2001). All about the Harappans, written for adults. Cite this page: Carr, K.E. Mehrgahr – Stone Age India. Quatr.us Study Guides, July 20, 2017. Web. April 20, 2019. I find this very helpful. Thank you! Thanks, Kim! I’m glad you liked it!